Aarco AA-11 A-Frame Sidewalk Board with Black Melamine Markerboard and Aluminum Frame 42"x24"
messages effectively. Great for restaurants, pubs, markets and retail stores. plastic camel foot floor leveling system and full width aluminum hinges. 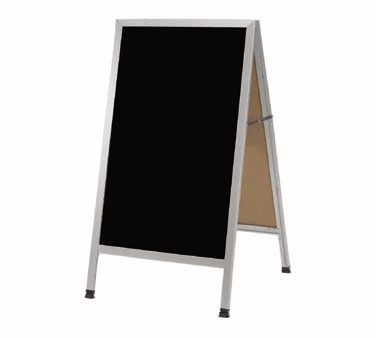 Aarco RB648 Radius Design Black Neon Markerboard 36" x 48"
Aarco A-11 A-Frame Sidewalk Board with Black Melamine Markerboard and Oak Frame 42"x24"
Aarco A-5 A-Frame Sidewalk Board with White Melamine Markerboard and Oak Frame 42"x24"
Aarco WDS4872 White Porcelain Markerboard with Aluminum Frame 48" x 72"